2018 is turning into a fantastic year with JSC winning the Department of Tourism’s Lilizela Award for best Adventure Experience in Gauteng for 2018. The club has been the grateful recipient of this award many times, but in the tough tourism environment, tightening of belts and rising operational costs, this is an awesome reprieve in the day to day operations of the Club. The Johannesburg Skydiving Club is still operated as a Club, run by a committee of volunteers, who through their passion and grit, ensure the safe and fun operation of Skydiving training, progression and Tandems continue every weekend. With this in mind, and the fact that the people involved in the running of the club all have full time jobs to take care of, makes this award even more rewarding. 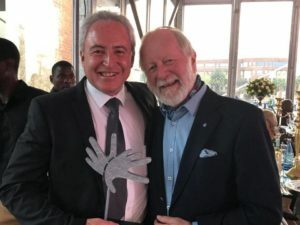 The competition was tough with stalwarts like Bill Harrop from Bill Harrop’s Balloon Safari’s coming in a close second at the awards ceremony, which was held at the Constitution Hill in central Johannesburg. Club Chairman Eugene “Pottie” Potgieter with Bill Harrop. The organizers of the event put on a great show, with the press, guests and nominees being entertained through the night. A massive thank you to the Department of Tourism for once again acknowledging JSC as the Adventure and Skydiving Club of Choice!